Once it was Democrats who complained about the culture of corruption in the Republican Party. These days far too many Democrats are keeping quiet over signs of corruption by their presumptive presidential nominee. There have been new revelations recently which are consistent with the view that Clinton might have been violating policy to cover up influence peddling as Secretary of State. There are mechanisms in place to try to reduce the risk of corruption by government officials, which Clinton frequently ignored. In light of this, she has only herself to blame, not the vast right wing conspiracy against her, when her actions are interpreted as signs of corruption. While Clinton has claimed for over a year that she was allowed to exclusively use her private email server, the State Department Inspector General report showed that her actions were unprecedented and in violation of the law. 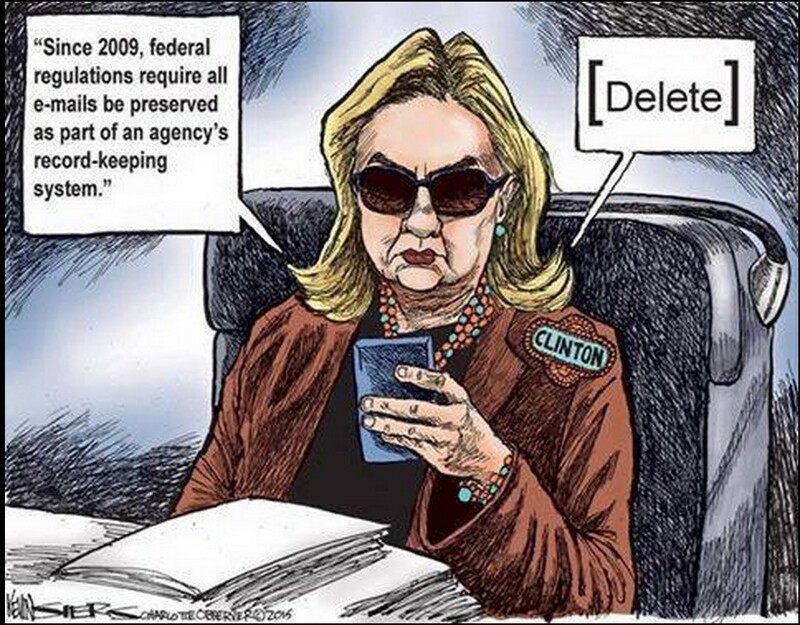 Clinton failed to turn the email over to the State Department to be archived, as required by law, and destroyed about half the email, falsely claiming that they were all personal. She also failed to abide by an agreement she made, due to the conflict of interest when she was appointed Secretary of State, to disclose all donations made to the Clinton Foundation. The email was included within messages exchanged Nov. 13, 2010, between Clinton and one of her closest aides, Deputy Chief of Staff Huma Abedin. At the time, emails sent from Clinton’s BlackBerry device and routed through her private clintonemail.com server in the basement of her New York home were being blocked by the State Department’s spam filter. A suggested remedy was for Clinton to obtain a state.gov email account. “Let’s get separate address or device but I don’t want any risk of the personal being accessible,” Clinton responded to Abedin. The email was not among the tens of thousands of emails Clinton turned over to the agency in response to public records lawsuits seeking copies of her official correspondence. Abedin, who also used a private account on Clinton’s server, provided a copy from her own inbox after the State Department asked her to return any work-related emails. That copy of the email was publicly cited last month in a blistering audit by the State Department’s inspector general that concluded Clinton and her team ignored clear internal guidance that her email setup violated federal standards and could have left sensitive material vulnerable to hackers. An Associated Press review of the official calendar Hillary Clinton kept as secretary of state identified at least 75 meetings with longtime political donors, Clinton Foundation contributors and corporate and other outside interests that were not recorded or omitted the names of those she met. The fuller details of those meetings were included in files the State Department turned over to AP after it sued the government in federal court. At a time when Clinton’s private email system is under scrutiny by an FBI criminal investigation, the calendar omissions reinforce concerns that she sought to eliminate the “risk of the personal being accessible” — as she wrote in an email exchange that she failed to turn over to the government but was subsequently uncovered in a top aide’s inbox. The AP found the omissions by comparing the 1,500-page calendar with separate planning schedules supplied to Clinton by aides in advance of each day’s events. The names of at least 114 outsiders who met with Clinton were missing from her calendar, the records show. No known federal laws were violated and some omissions could be blamed on Clinton’s highly fluid schedule, which sometimes forced late cancellations. But only seven meetings in Clinton’s planning schedules were replaced by substitute events on her official calendar. More than 60 other events listed in Clinton’s planners were omitted entirely in her calendar, tersely noted or described only as “private meetings” — all without naming those who met with her. While it is not known if this was part of an effort to cover up meetings with donors, there is little doubt that Democrats would be complaining quite loudly if similar behavior was seen in a former Republican cabinet member and presidential candidate. Members of each party must be held to the same standards. Under normal circumstances, it is hard to see a major political party nominating a candidate with as much baggage as Hillary Clinton. Posted in Hillary Clinton, Scandals. Tags: Hillary Clinton, Scandals. RSS feed for comments on this post.. TrackBack URL.